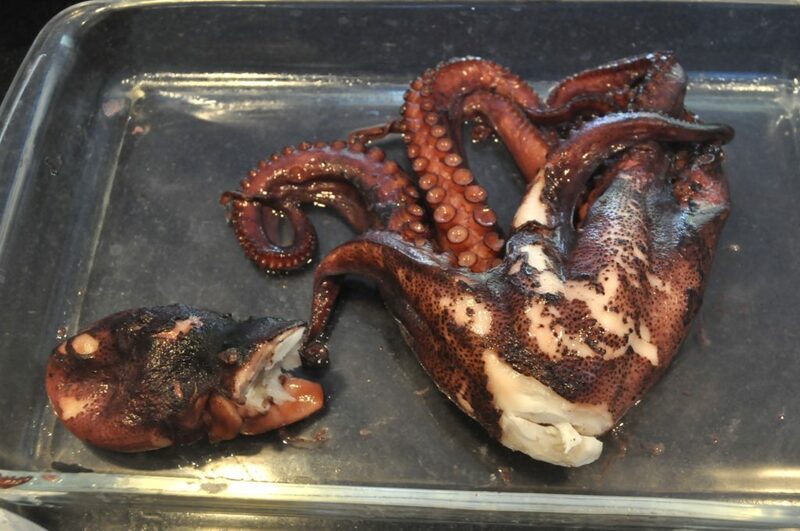 Thank you dear readers, for not clicking off this post when you saw the word “octopus.” Now I know many of you have eaten octopus, but wouldn’t think of cooking it any sooner than you’d think of jumping into the Atlantic Ocean in January. But wait! It’s easier to cook than you think and tastes infinitely better than anything you could buy already prepared. With Christmas eve coming up, I thought I’d revisit this recipe that I posted when I first started blogging in 2008. The hardest part is getting over the squeamish feeling you might have about handling this unwieldy cephalopod. But if you think this is unwieldy, try hoisting a live, squiggly octopus into a boat, as I once did off the coast of Sardinia – an activity I hope to duplicate again next summer. I can buy octopus fresh at my fish store in the Christmas season, but it also comes frozen at the grocery store. The frozen ones (from Mediterranean countries) are quite good, and the freezing process actually helps to tenderize them. Buy the biggest one you can because it shrinks a lot, and the bigger the octopus, the larger and more “meaty” your slices will be. This one weighed about three pounds. Maybe you’re still reading this, but I bet you’re still not on board with me, are you? I know, it is slippery and ungainly. But hey, you can check it off your bucket list! What? 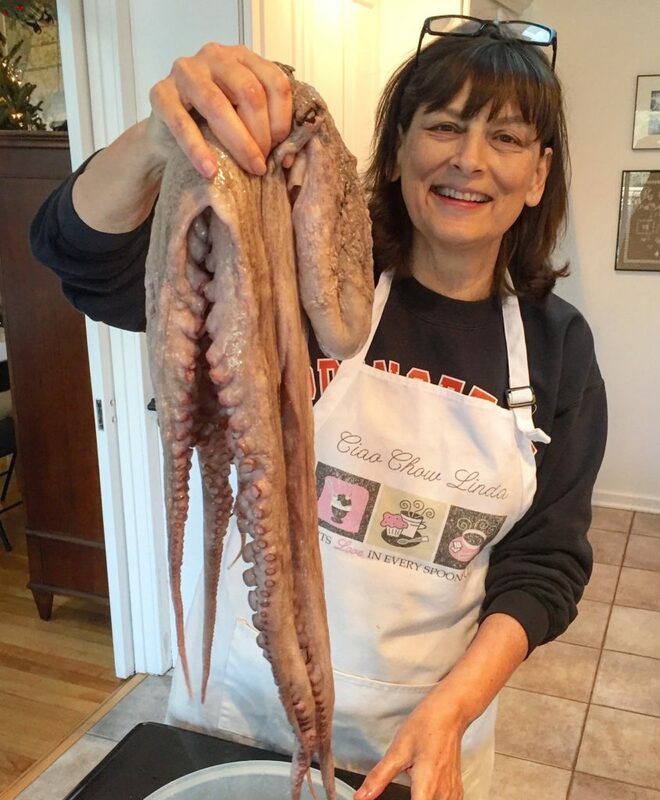 “Cooking an octopus” isn’t on your bucket list? Come on, where are your priorities? Alright then, for those of you intrepid folks still with me, you probably know there are many thoughts on the best way to cook an octopus to make it tender, some of them involve thrashing the octopus on rocks, and some involve cooking with a cork or dipping it into boiling water three times before immersing it completely. I don’t do any of those and I am here to tell you that I’ve been cooking octopus for years and my technique ALWAYS produces a tender result. 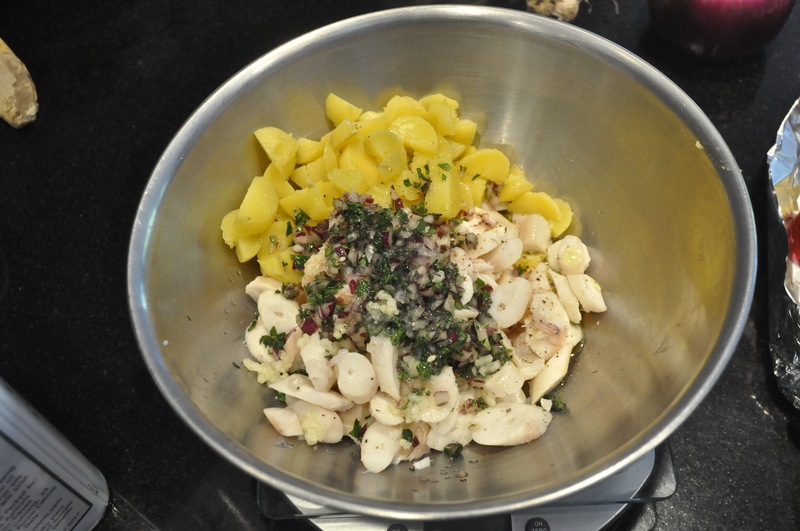 You start out by placing the whole octopus into a sturdy pot where you’ve placed a bit of olive oil on the bottom. It cooks, in its own juices, over low heat on the range, covered, for about 20 minutes. After that time, it will have shrunk a lot and turned a purple-y color. 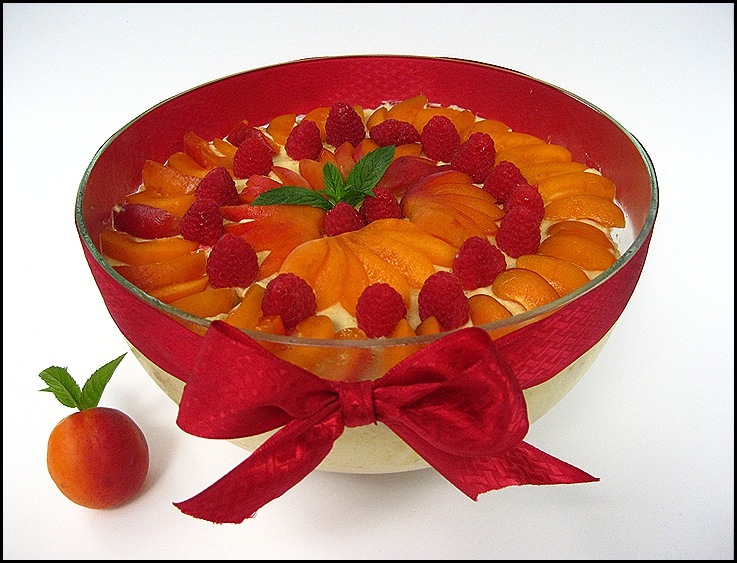 Transfer it to a glass or pyrex or ceramic baking dish, cover and bake in a 300 degree oven for one hour. It will shrink a little bit more after baking for an hour. Let it cool in its own juices. Now this next part is messy, I’m the first to admit. But big whoop – you have a sink with running water, right? So you just wash your hands afterwards. OK, let’s get down to business. 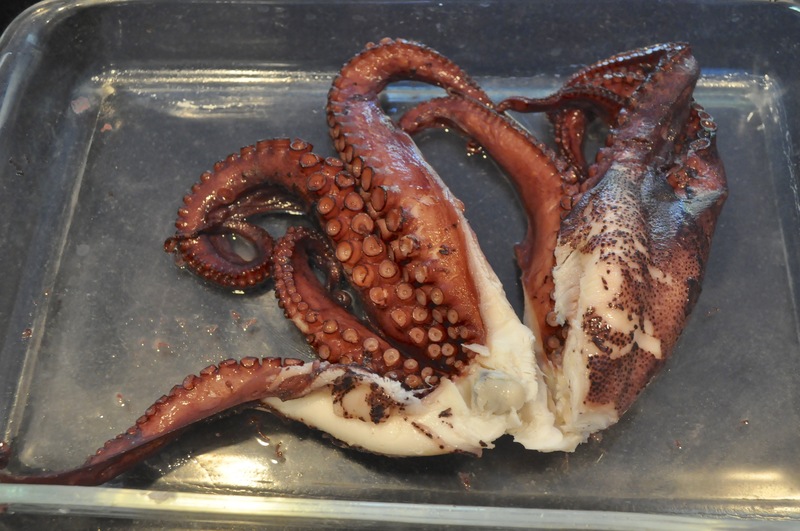 After the octopus has cooled enough to handle, cut off the head from the rest of the body. See that grey-ish opaque thing-y at the juncture where the legs meet the head? That little “beak” feels like hard plastic, so remove it with a paring knife. Throw it out, along with the head (although some people do eat the head). 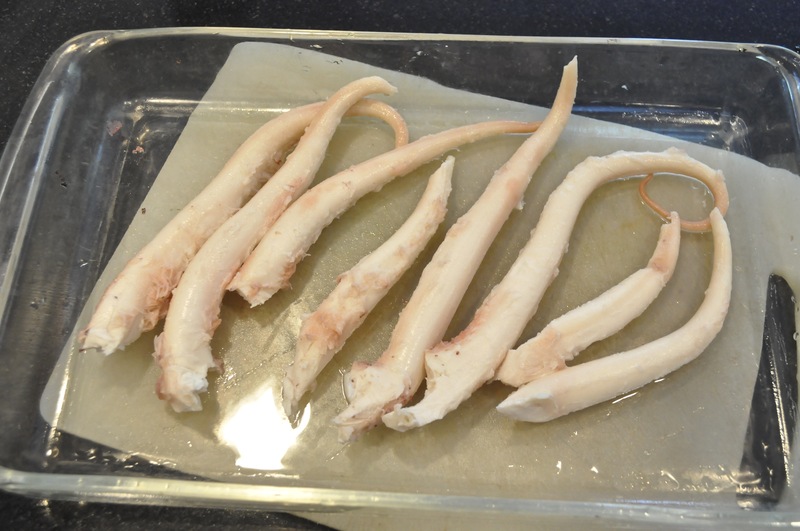 Now take a sharp knife and separate the legs (tentacles) from each other. Many people (and restaurants) serve the octopus with the suckers still attached, but in larger octopi especially, I think the suckers and surrounding skin taste gelatinous, and I prefer to remove them. Besides, removing the suckers leaves you with white flesh, which is more appealing to me visually in this salad. But if you like the suckers, by all means, leave them on. One of the best octopus dishes I’ve ever eaten – at Porta in Asbury Park, N.J., is served with its suckers on. It’s dripping in butter, which may have something to do with why it’s so good – along with the capers and fennel and parley salad it’s served with. If you want to remove the suckers however, a quick way is to hold each tentacle under cold running water, and use your fingers to “scrape” along the length of the leg. Pat dry. Slice the octopus and place in a bowl. Add the potatoes and the rest of the ingredients and mix well. Caveat emptor, octopus is not inexpensive. Octopus for a salad of this size (serving four as a salad, or eight as an appetizer) will cost from $35 to $50 at the fish store. But for a once a year special event, like Christmas eve, it’s worth it. 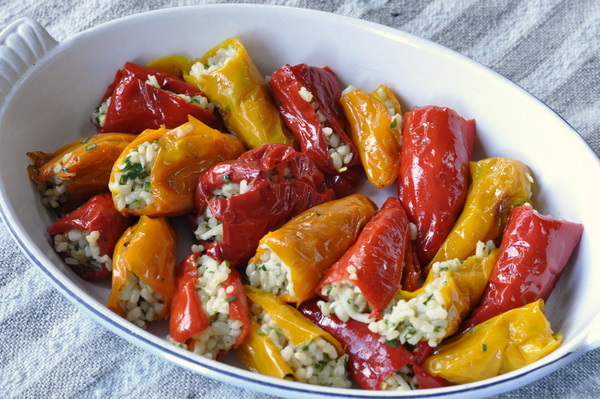 Serve it as an appetizer with crusty slices of bread, or as a side salad. Now have I convinced you to cook octopus? Spero di si. Buon Natale tutti. 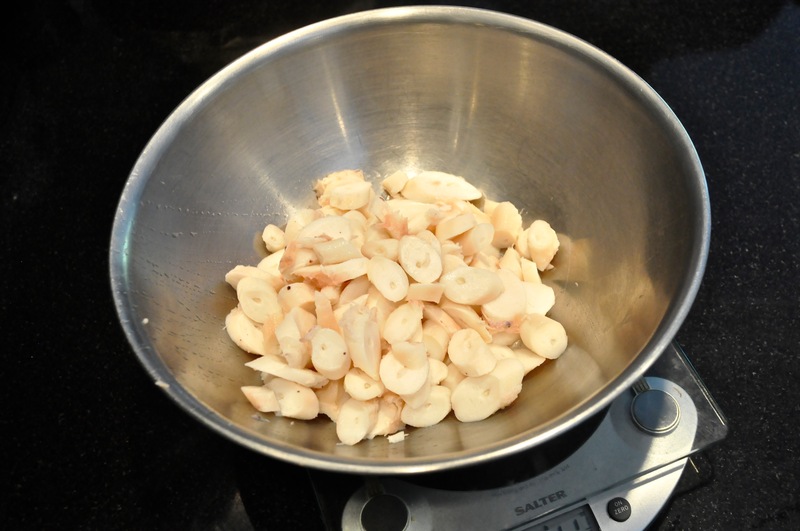 Place olive oil on the bottom of a sturdy pan and put over low heat, lowering the octopus into the pan. Cover with a lid and cook over low heat for 20 minutes. In the meantime, cook the potatoes in water until just tender, then remove from water and let cool. 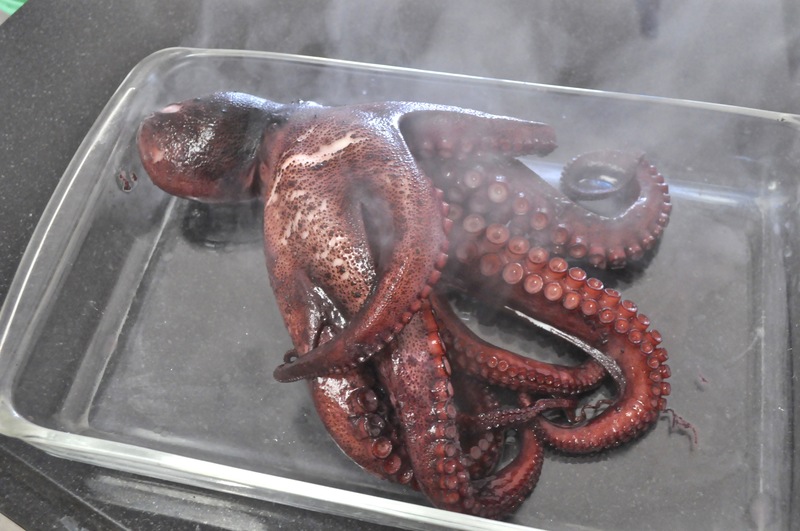 Remove from heat and put the octopus in a glass or ceramic dish. Cover and cook in a 300 degree oven for one hour. Cut the head from the octopus and remove the beak. Remove the suckers and outer purply skin by rinsing under cold water. Slice the octopus and the potatoes, then mix with all the other ingredients. Adjust seasonings to taste. 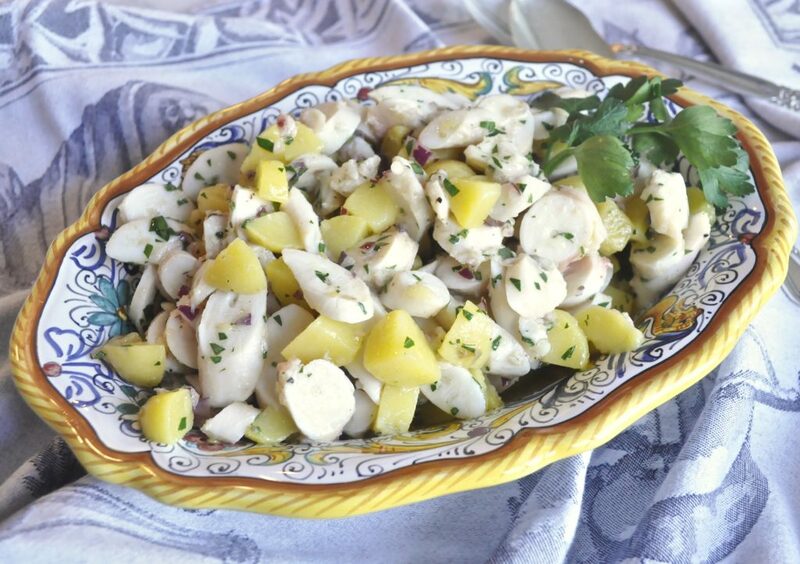 amo l’insalata di polpo con le patate,tu sei bravissima a spiegare come si fa, un abbraccio !Gli auguri di Natale più avanti, ho ancora troppe cose da fare, sono in ritardissimo ! 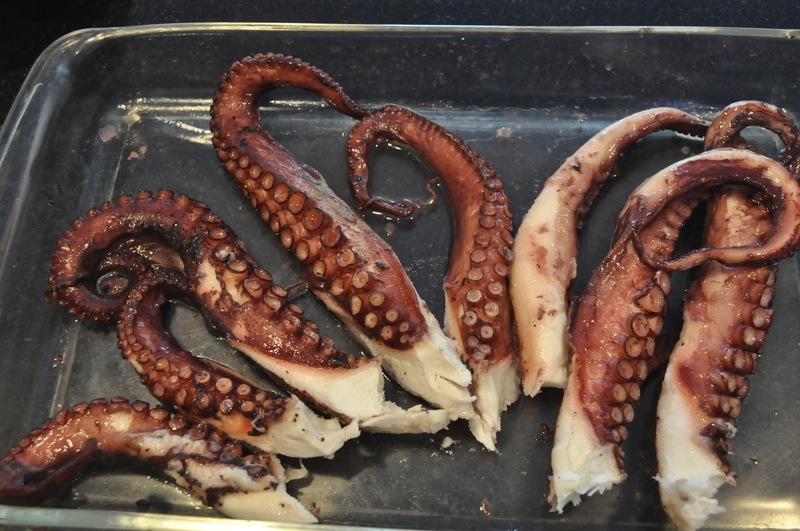 I love octopus–boiled, grilled, baked! I wish I could find a big one like the one you are holding here, Linda, but in this mountain state I’ve had to settle for mini frozen ones from the Asian store. This year I actually found in Costco, an octopus salad prepared and packaged in Italy! It was $19 a pound, but all the work was done! Linda, my kids LOVE octopus and order it all the time in restaurants, they would faint if I made this for them! You make it sound so easy and most importantly you say your way comes out tender every time. I always thought I’d have to beat the heck out of it! Polpo is my favorite……however, when I look at it raw in these pics, I could really get turned off!!! UGH! I’ve never seen an octopus like that sold here! It’s huge! 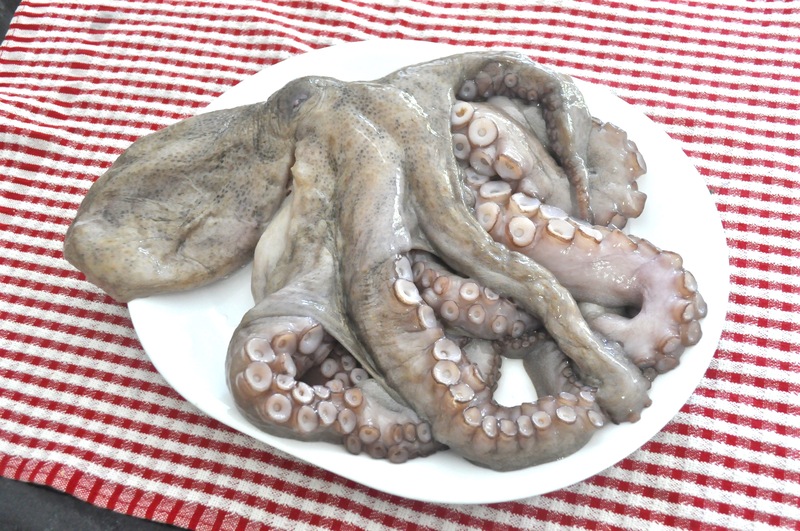 I do love octupus and this would be a real treat for our gourmet group when we host. These are EXCELLENT instructions for handling something that is quite tricky. We adore octopus in any form and are fortunate to have a reliable provider locally. Speaking of Sardinia, one of our favorite restaurants La Ciccia owned by friends prepared a spicy polpo which I often refer to as my last meal dish. 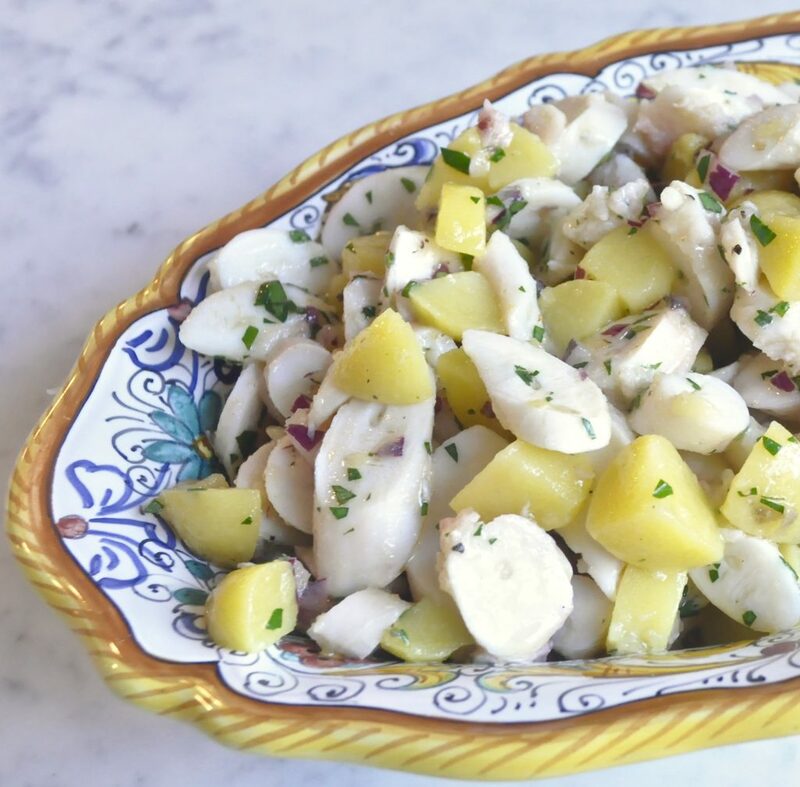 Octopus and potato salad is a fantastic way to start off the Christmas Eve celebration. What, that’s quite an octopus! I’m not surprised that it cost that much. And what a dish this is. You’re right, it’s totally worth it for a special occasion like Christmas Eve. Hmmm, yes, I did wonder what this recipe was and what a massive octopus! I’ve eaten octopus but never prepared it. If I ever have the chance, I will remember this post and refer back to it because the instructions are brilliant! 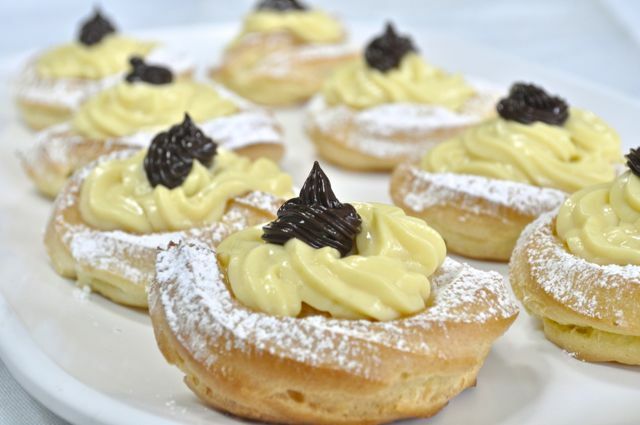 Buon Natale! I’ve not cooked one but if they were available in our market, I know my husband would want us to. 😀 Hope you had a wonderful Christmas.